The name of this application has changed! Prior to KDE SC 3.5, this application was known as KTTS. The name has changed to Jovie. Depending on your distribution, you may still see KTTS installed on your system or in your distributions package repositories. 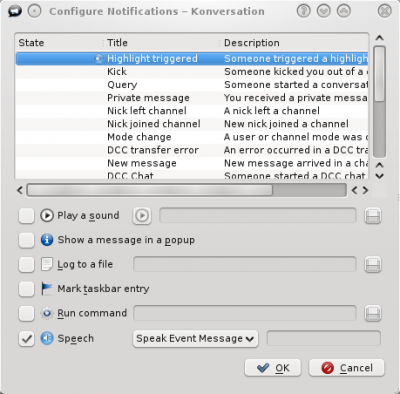 The KDE Text-To-Speech System Jovie is an application that can run in the background to provide speech output of text throughout the desktop. It integrates with many applications and is simple to use.
. Jovie is not initially setup and you will need to do this before using its speaking abilities. The first step is to make sure you have a compatible speech engine installed. The following synthesizers are compatible with Jovie: Festival, Festival Lite (flite), Hadifix, Epos, and FreeTTS. Any engine that can be run from commandline can also be used with Jovie. Now you can continue on and create a Talker. 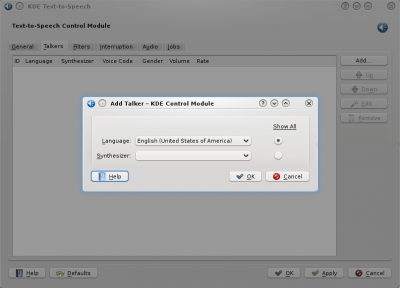 Select the tab Talker from the Text-to-Speech Control Module and click Add. Select which language and synthesizer to use. You will need to have a voice installed to use Festival, you can configure this afterwards by selecting the Edit button. Jovie should now be setup and you can test it by selecting Edit and then Test. If enabled in the configuration, Jovie will be availabe to you in the System Tray. Right-clicking it will reveal the menu which is straight forward and allows for control of the speech output. Notice the Speak Clipboard Contents in the menu, if the application isn't integrated with Jovie (Read more about the applications with Jovie built-in in the next section) you can copy the text you want spoken, and click Speak Clipboard Contents to hear it read. Jovie allows you to speak the text on a web page. In the menu go to Tools -> Speak Text. However you may not want to do this because it will also read the HTML headers on the page. Instead highlight the text you want spoken and then select Speak Text. Also note this feature is built into Okular as well. In the Tools menu you will be give two choices Speak Whole Document or Speak Current Page. If an application doesn't include the ability to speak text remember that you can always highlight and copy text and then use Jovie to speak your clipboard contents. If Jovie is silent despite having added a voice, try running the speech-dispatcher configuration tool on the command line. For more information check out the Jovie Handbook included with Jovie or the Jovie handbook. This page was last modified on 8 March 2012, at 20:31. Content is available under Creative Commons License SA 4.0 unless otherwise noted.